The geographically expansive country of Chile reminds us how truly beautiful a creation is Mother Earth. From its rugged coastline to its mountainous horizon, strikingly blue lakes and glassy rivers, dense green forests and sprawling desert, it can be difficult to narrow down exactly what to see in Chile. Craft Travel offers to you a way to break it down into manageable bites, starting with a full immersion into the Southern half’s glaciers, lakes and forests that make Chile’s nature so stunning. Explore charming islands, volcano summits, fly fishing, hiking, biking and more on this fantastic trip through South America’s gem. The lodging in this package is not to be overlooked. Enjoy stays at two of the most unique properties in Chilean Patagonia. Barraco Lodge, in Northern Patagonia, is a fully sustainable, renovated traditional settler’s lodge. Take advantage of everything from fly fishing to river rafting, horseback riding to heli-skiing. After a full day of adventure, head back to the lodge for a home-cooked meal, spa services, wine or beer, and a cozy fire. The Tierra Hotels in Chiloe and Southern Patagonia are just as special. Tierra properties are boutique family-run lodges are inspired by nature, offering tailored expeditions, authentic dining and seamless adventure-spa trips, with landscapes and views that are nothing less than stunning. DAY 01 | WELCOME TO CHILE! Upon arriving in Santiago, you will be picked up and taken to your hotel. Luggage and hotel check in assistance will be offered. After check in, your guide will be waiting to take you out on a half day tour of the bustling city of Santiago! After an early breakfast and hotel check out, your driver will be waiting to take you to your flight from Santiago to Puerto Montt (not included. Approx. 1hr 45min flight time). Upon arrival in Puerto Montt, a transfer will pick you up and take you on a scenic drive to Barraco Lodge (approx. 3 hours driving time), where you will enjoy lunch after check in. This afternoon, head out on your first excursion in nature with a little fly fishing! All equipment will be included to make this experience unforgettable. 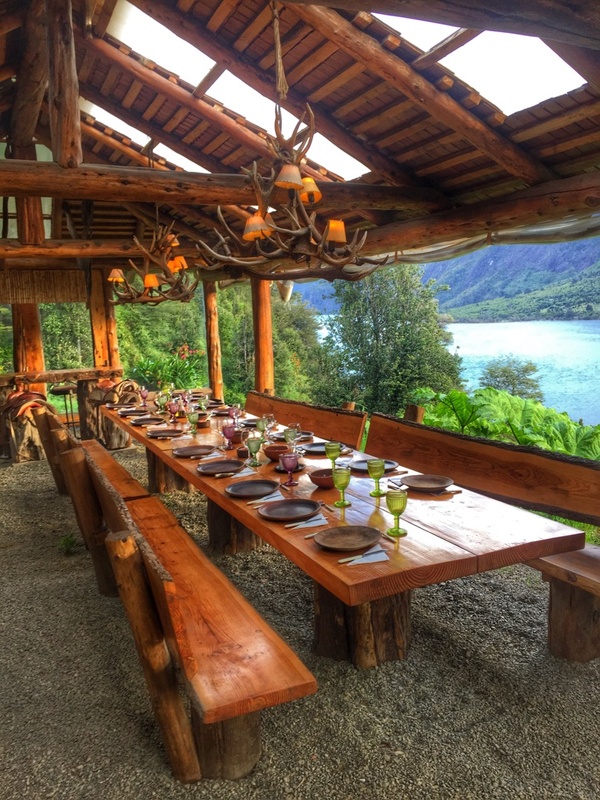 Located on 150 acres bordering Lake Tagua Tagua and the Puelo River, Barraco Lodge is ideally located to explore the natural treasures of northern Patagonia and the Pacific coast: wild rivers, waterfalls, hidden lakes, glaciers, volcanos, granite cliffs, and some of the oldest rain forests in the world. Barraco is a typical Patagonian style lodge, built entirely with local craftsmen and materials. The renovation of the main house, 1940 colonial style, was directed by Edward Rojas, an authority in regional architecture. His philosophy is to build in harmony with the surroundings. Barraco is one of the best equipped lodges in the region, with helicopters, motor boats, kayaks, river rafts, and horses. Professional guides are available for fly fishing, river rafting, hiking, camping, horseback rides, and heli-skiing. After a day of adventure, the lodge awaits with hot tubs, sauna, massage, Chef Maite Daroch´s cuisine, selected wines, craft beer, and a cozy fire. Fuel up with a hearty breakfast for a full day of exploration! Start your day with a morning kayak & Stand Up Paddleboard trip through Lake Tagua Tagua to Puerto Maldonado. Continue rowing towards the magnificent waterfall passing through the bar where Rio Puelo fills the lake. View one of the greenest bodies of water in the area, in a landscape formed by the impressive mountains of Patagonia. Observe wildlife such as Chungungos, Ciaquenes and Ibis. After you’ve completed your kayak and SUP adventure, a jet boat will be waiting to take you back to land where you will indulge in a typical Chilean barbecue lunch. Your transfer back to the lodge will be on horseback, where the remainder of the day will be yours to enjoy as you wish! Today’s trekking excursion will last the full day, taking you deep into one of Chile’s most stunning parks, Park Tagua Tagua. With your naturalist guide, explore this untouched area whose mountains dominate the landscape that is home to imposing waterfalls of the most natural sources and thick evergreen forests, uninhabited by human life. After this morning’s final breakfast at the lodge, you will check out and be transferred to a volcano by jeep (or simliar), which you will hike along with your guide. A helicopter will pick you up at the summit, in which you will be transferred to your lodge in Chiloe. Hotel Tierra boasts, among other perks, a helicopter pad, making it an ideal form of transportation for arrival! Enjoy dinner and beyond this evening at your leisure, exploring the surrounding area or simply relaxing in the hotel. Work with a local concierge to plan your schedule of activities for the coming days. 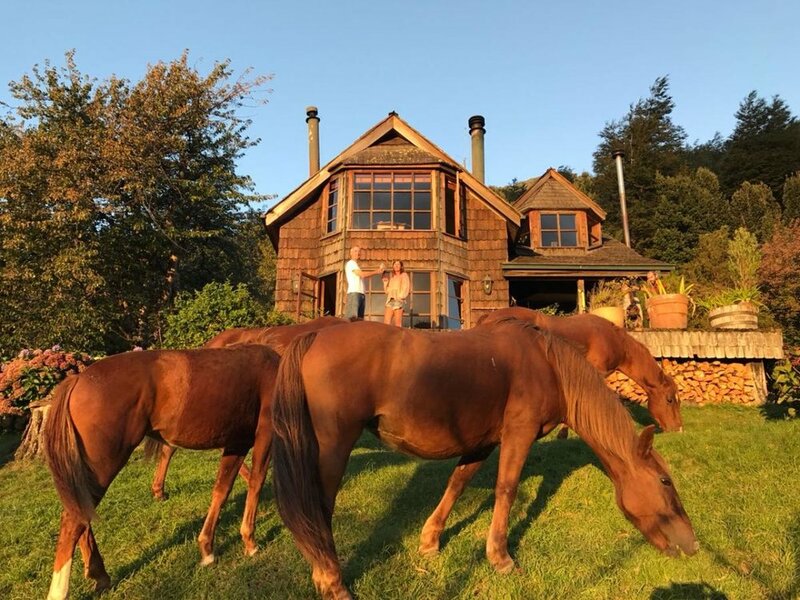 Take a step back to simpler times at Tierra Chiloé, a boutique spa hotel where intrepid adventures are coupled with comfort, sea views and the promise of authentic experiences. Our passion for the island is rooted in the foundations of our Chiloé adventure lodge, with eco-friendly architecture that makes the most of the island’s changeable climate for heating and ventilation. Made of locally sourced wood and clad in shingles, the exteriors mimic the traditional homes of local fishing communities. Inside, panoramic windows in the restaurant and living areas allow for uninterrupted Pacific Ocean views, which change constantly as the clouds and light play across the water. Quintessential island life and sophisticated modern comfort meet hand-in-hand at Tierra Chiloé. Every piece of furniture and decor has a story, as Chilean designers have collaborated with local craftspeople to curate a space which is relaxed and welcoming. Our team of friendly staff and guides are on hand to help you discover the genuine warmth of the islanders, through our excursions that provide insights into the local traditions and myths. During your trip to Chile, a visit to Tierra Chiloé Adventure and Spa Hotel will restore your soul through an appreciation of the simple things in life that mean so much. With lush green hills and Pacific Ocean blues all around, hiking the Island of Chiloé is at once breathtaking, fun, and nourishing for the soul. Consider a half or full day guided hike through the “Wetlands of Chile” or the dense forests of Bosque Piedra Private Park! Pedal your way through Chiloe, with an assortment of self-guided and locally guided biking journeys around the island. Visit three important local churches and get your cultural fix. or combine your biking adventure with a sailing excursions on the hotel’s private boat to the islands of Chelin and Quehui. Enjoy one final excursion in Chiloe this morning after breakfast (time permitting). Check out of the hotel before being transferred by ferry and car back to Puerto Montt to catch your flight (not included. Approx. 2hr 10min flight time) to Punta Arenas. Spend the night in Punta Arenas, resting up for the second half of your action packed trip! After breakfast and checkout, your driver will be waiting to take you on a 4 hour journey through Chile’s stunning landscape to your final destination, Tierra Patagonia Adventure Hotel and Spa. Depending on time of arrival, you may enjoy both lunch and dinner at your leisure at the hotel. Plan your final days’ adventures in Patagonia with the hotel concierge to make the most of your days here in this natural paradise. At Tierra Patagonia Adventure and Spa Hotel, we invite you to forge your own relationship with Torres del Paine National Park. At Tierra Patagonia, you’ll find yourself completely surrounded by wilderness, and you can enjoy an endless array of outdoor excursions. The building’s architecture is beautifully integrated with the landscape and offers stunning national park views. The hotel’s design is purely Patagonian with locally-sourced materials and artworks. Relaxation and pampering await you here after a day of exploring. Our Uma Spa restores your mind, body and soul, as do the warming fires and friendly service. 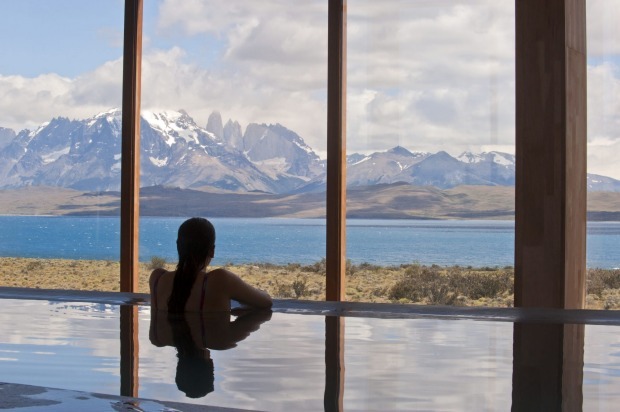 Tierra Patagonia is a true home-from-home boutique lodge where adventure travel and luxury are combined. Torres del Paine National Park is world-renowned for its great hiking paths and stunning views. From pristine forests, blue glaciers and interesting wildlife – hiking at Tierra Patagonia is not to be missed Close to the border between Argentina and Chile is the perfect place to start your Patagonian journey. Beginning with a gentle stroll along the shores of Lake Sarmiento, next to the hotel, you can see the mountainscapes of the Cordillera Paine and Sierra Baguales on the horizon at every turn. The choice is yours, but perhaps today is the day to visit Chilean cowboys at Estancia Lazo. From here, enjoy an hour-long horseback ride through an ancient lenga forest, before arriving at a clearing for some truly astonishing views of the Paine Massif. What will you do for your final day? Fishing in one of Patagonia’s hot spot rivers and lakes or kayaking on the peaceful glacier waters of Lake Grey, surrounded by imposing ice sculptures? Maybe a half day cultural excursion of the local village followed by an afternoon luxuriating at the spa is calling. Whatever you decide, enjoy your last full day in stunning Patagonia. After breakfast this morning, bid farewell to the Chilean Patagonia. Your transfer will be waiting to take you to the airport at either Punta Arenas or Puerto Natales (season dependent) for your departing flight home through Santiago.